This tallit/tefillin bag has the traditionally inspired styled design. Its elaborate yet delicate corner design starts at the lower right hand side of the bag, continues into geometrical lines with flower pedals and dainty dots. 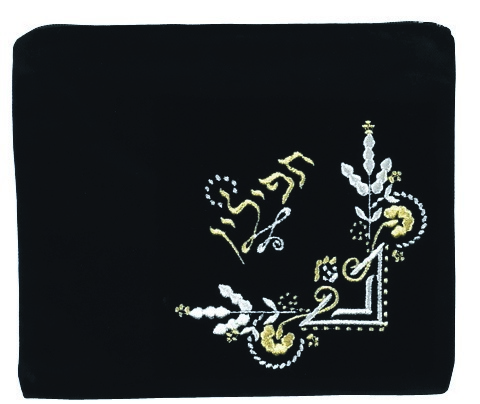 The velvet zippered bag has the Hebrew word “tallit” or “tefillin” elegantly embroidered diagonally above the design. Please select the intended use of the bag being purchased from the options drop down to ensure that the correct Hebrew word will be on the bag.